Figure: Example of the phase calibration of data obtained for the horizontal polarization. The command ``solve phase /plot'' was used in the first plot, ``solve phase /plot /break 1 14.7 3 15.2'' was used in the second one. The introduction of sharp breaks in the phase calibration should always result from an analysis of the reasons for such phase jumps. In most projects we observe, alternatively to the source(s), one or two phase calibrators, for which `ideal' phases (without instrumental contribution) are known to be zero for all the baselines. The track of these phases allows us to measure and remove possible instrumental contributions. 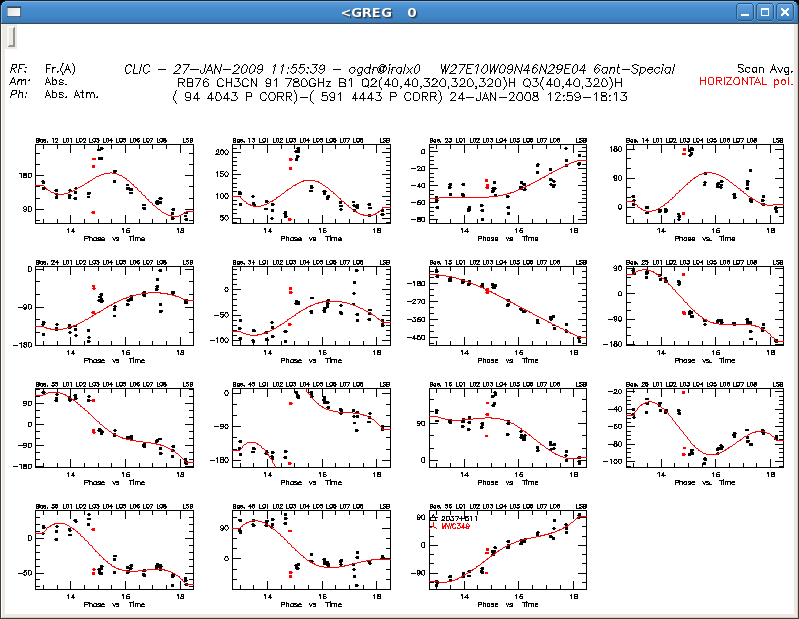 The phase fittings for the calibrators observed cyclically with the source (set by Select, Sect. ) are obtained with the command ``solve phase /plot''. Breaks and jumps can be introduced in the fit with the option ``solve phase /break `break_degree' `break_time' ''. Break_degree is the order of the polynomial derivative that is discontinuous at the break point, the sharpest one being 0. Break_time is the UT time (h) at which the break should happen. (See two examples of phase calibration in Figure .) The option ``/weight'' can be used to take into account the weight ( SNR) of the different calibrators, and ``/polynomial'' to impose polynomials of a given degree (the last option is incompatible with the use of breaks). More information can be found in the CLIC manual, or by typing ``help solve phase'' in CLIC. The procedure pauses after proposing a fit. A previous solution can be removed from the plot with ``clear seg'' to try a new one. A solution is accepted by entering ``c'' in the line of commands. The phases are calibrated independently for each polarization, and stored in the hpb file at the end of the procedure. The choice of phase calibrators used to calibrate the source phases and amplitudes is performed by Select (see Sect. ). If you disagree with the choice, it can be modified with ``let phcal `list_of_calibrators' ''. The phases and amplitudes of the calibrators not included in this ` list_of_calibrators' are self-calibrated. Note that if the frequency-averaged phases from H and V polarization receivers are not equal (which for instance can be seen in the RF phases plot, see Sect. ) self-calibration should be avoided, and hence ``let phcal `*' '' should be entered after Select (Sect. ). If due to some poor data obtained in a limited time interval, the fit fails in other interval in which the phases seem well constrained, we can divide the phase calibration in two parts, by specifying the scan intervals in the main calibration widget. We should just pay attention that no source data remains uncalibrated between the two selected intervals. From time to time the procedure crashes because too many calibrator data are flagged for an antenna or baseline. To find a proper solution for the other baselines we can just mask (see point 2 in Sect. ) whichever the flags, solve the phases for all baselines, and reset at the end these masks. Verify at the end that the source data that were calibrated with flagged calibrator data are not used. If the data obtained for a calibrator are too bad, and are not needed in the calibration, we can flag them as indicated in Sect. .